South Florida’s drive to host the 50th Super Bowl in 2016 was still very much alive in mid-April, as Miami Dolphins owner Steve Ross offered taxpayers incentives to split the $350 million cost of a stadium upgrade with him to woo the NFL’s big game. “It’s a deal the likes of which has not been seen in the whole country,” says Rodney Barreto, volunteer chairman of the South Florida Super Bowl Host Committee. He says it’s a good deal for taxpayers, and the stadium upgrade is a necessity for Miami to host future Super Bowls. Boat show organizers, however, remain adamant that a new National Football League requirement that Super Bowl bidders be ready to host the game on any of three weekends in February, including Presidents Day — when the Yacht & Brokerage Show in Miami Beach and the Miami International Boat Show are scheduled — can only be bad news for the shows. Barreto, however, says the odds of Super Bowl L and the boat shows falling on the same weekend are remote because it won’t happen unless the NFL lengthens its schedule. That is unlikely as long as the league and its players are in discussions on what to do about head injuries and their long-term effects on players. The players don’t want a longer season. 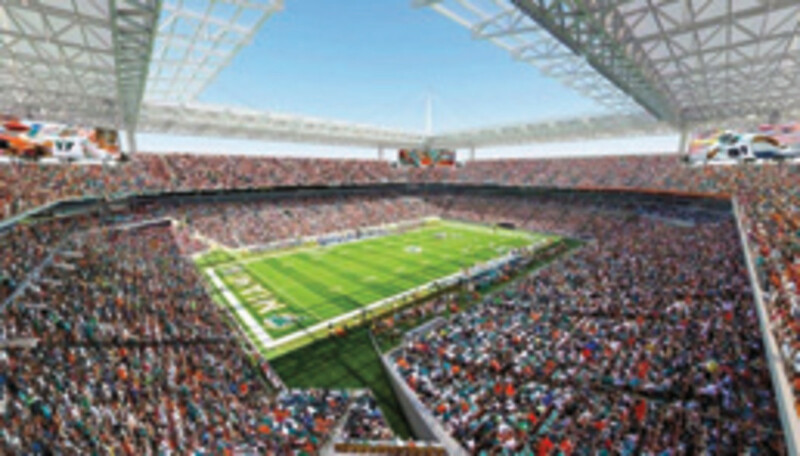 Ross has stepped up his offense in an effort to persuade the legislature, the Miami-Dade County Commission and Miami-Dade voters to use public money to help pay for stadium improvements, including an open-air canopy over seating, stands moved closer to the sidelines, 3,700 more seats, wider and more comfortable seats, and giant high-definition video boards. On April 9, the push paid off. The county commission approved a deal to raise the mainland hotel bed tax from 6 to 7 percent to help pay for the stadium upgrade, and it set May 14 for a referendum so voters can decide if they want to go along with the deal. The NFL is supposed to decide by May 22 which city gets the 2016 Super Bowl. To make the taxpayer contributions more palatable, Ross says he will pay for the referendum; pay back $112 million to $120 million in bed tax money to Miami-Dade County and $47 million in stadium sales tax rebates to the state by 2043; agree to keep the Dolphins at Sun Life Stadium for at least 30 years; and give the county and state the option to withdraw from sharing the cost of the stadium upgrade if Miami does not win the bid for a Super Bowl (not necessarily the 50th) at the May 22 NFL meeting. A county analysis of the deal released April 9 says the NFL and Ross would pony up $191 million, the county $112 million and the state $47 million for the renovations. Miami’s aging stadium is vying with San Francisco’s new $1.2 billion stadium for the 2016 game, and whichever city loses that bid competes with Houston for the 2017 game. The organizing committee also has done its part to sweeten the pot for Miami-Dade by submitting its April 1 bid for Super Bowl L with a plan to host most, though not all, of the core game activities in Miami-Dade rather than Broward County, Barreto says. The boat shows are on Collins Avenue and at the Miami Beach Convention Center in Miami Beach, and at the Sealine Marina & Yachting Center and Bayside Marketplace near downtown Miami. Responding to concerns about the boat shows and Super Bowl together overtaxing the region’s tourism infrastructure, Barreto says William Talbert III, president of the Greater Miami Convention & Visitors Bureau, had changed his mind and says there are enough hotel rooms in Miami-Dade and Broward counties to accommodate all three events. “We’ve taken a look at it,” Barreto says. “The Convention & Visitors Bureau has gone out to the hoteliers, and to Bill Talbert’s surprise their response was that they could handle it.” Barreto says the inventory of rooms has increased significantly since 2010, when Miami last hosted a Super Bowl. Regardless of how many hotel rooms the region has, only so many of them are prime and conveniently located, Zimbalist says. With the Super Bowl in town “there’s going to be a lot of competition for those rooms, and it will drive prices up,” he says. “That will be detrimental.” And world-class city or not, traffic will still be an issue. However, there is plenty of hard evidence that boat show exhibitors and visitors are nervous about navigating Miami with the Super Bowl in town. A survey of past Yacht & Brokerage Show exhibitors and visitors confirms that anticipated hassles with parking, crowds, pricey hotel rooms and other inconveniences would douse their interest in attending a show. One in three exhibitors (34 percent) say they would be less inclined to participate in either the Miami boat show or the Yacht & Brokerage Show. Nearly three in four exhibitors (65 percent) are concerned about parking and inconvenience, and more than half (54 percent) were less likely to attend either show because of much higher hotel costs. Only one in five say they would likely attend the Super Bowl in addition to one or both of the shows. The exhibitors say their chief concerns are parking availability and pricing (76 percent), hotel accommodations and special boat show room pricing (68 percent) and bus transportation to and from the shows (51 percent). Among consumer respondents, 53 percent say they would be less likely to attend either show if they are on the same weekend as the Super Bowl, according to the Jan. 17 survey. At the end of March, the legislation authorizing $3 million a year in state sales tax rebates on goods and services sold at the stadium had passed four Senate committees and one House committee by large majorities. Barreto expected the legislation to clear the statehouse but acknowledges that Miami-Dade commission and voter approval of the hotel tax increase remains an “uphill battle” after a disappointing experience with the Miami Marlins’ new major league baseball stadium. Miami-Dade kicked in 80 percent of the $634 million to build the stadium, then saw the team’s owner trade away the best players for cheaper prospects after a dismal 2012 first season in the new stadium. Rick-Joule says she, NMMA executive vice president Ben Wold and NMMA president Thom Dammrich met with Miami-Dade County Mayor Carlos Gimenez and Greater Miami Convention & Visitors Bureau president Talbert in mid-January to air their concerns about traffic snarls, hotel inventory and rates, and inflated airfare if the boat shows and Super Bowl are on the same weekend. “Mayor Gimenez guaranteed us that he would do everything in his power to minimize the impact of the Super Bowl [if it falls on Presidents Day weekend] and control those things that are controllable,” she says. Still, she is worried that if the shows and the Super Bowl were scheduled for the same weekend, some exhibitors and consumers would scratch the boat shows off their calendars because of flight or hotel costs and wouldn’t put them back on for the next year. “They might not come back,” she says. Rick-Joule says the numbers speak for themselves. Miami-Dade will have to kick in $21 million to organize Super Bowl activities and lend Dolphins owner Ross $167 million to upgrade the stadium. The return on investment: an estimated $300 million to $500 million in economic impact, depending on whose analysis you read. In her opinion, it’s a no-brainer. “We’re going to have to stay on opposite sides of the fence on this one,” she says.